Macpherson, Ian. "United Farmers of Alberta". The Canadian Encyclopedia, 04 March 2015, Historica Canada. https://www.thecanadianencyclopedia.ca/en/article/united-farmers-of-alberta. Accessed 22 April 2019. In 1915 it organized the United Farm Women of Alberta, which energetically campaigned for WOMEN'S SUFFRAGE (gained in Alberta in 1916) and struggled to secure better education and health services in rural Alberta. The UFof A after they won their first election in 1921 (courtesy PAA). United Farmers of Alberta, a farmers' organization established Jan 1909 in Edmonton as an amalgamation of the Canadian Society of Equity and the Alberta Farmers' Association. The UFA was interested in rural economic, social and political issues. In 1913 it prompted the provincial Liberal government to organize the Alberta Farmers' Co-operative Elevator Co, which in 1917 joined with the Grain Growers' Grain Co to form United Grain Growers. In 1915 it organized the United Farm Women of Alberta, which energetically campaigned for WOMEN'S SUFFRAGE (gained in Alberta in 1916) and struggled to secure better education and health services in rural Alberta. In 1916 the American NON-PARTISAN LEAGUE came to the province and encouraged direct political action by farmers. Close ties developed between the league and the UFA, which entered politics amid postwar unrest. 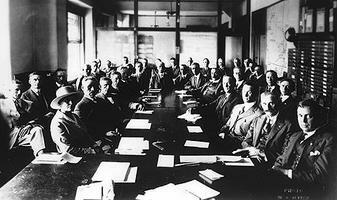 The UFA was elected in 1921 and remained in office until 1935. It formed a cautious, pragmatic government which advanced educational and health services and tried to meet the financial and marketing needs of farmers, but it did not cope well with the GREAT DEPRESSION. The most powerful early force in the UFA was Henry Wise WOOD, a charismatic farmer from Carstairs. He supported group government but refused to lead the UFA when it was elected. UFA premier 1921-25 was Herbert GREENFIELD, followed by John BROWNLEE (1925-34) and R.G. REID; Reid held office until the 1935 victory of SOCIAL CREDIT. After 1935 the UFA avoided direct political involvement but continued to provide supplies to members through local co-operatives. In 1948 it became the United Farmers of Alberta Co-operative Ltd, one of the strongest farmer-owned organizations in Alberta.